“The Age of 3D CAD Un-Enlightenment!" This is the fourth in a series of articles documenting my experience with the introduction of 3D CAD into industrial/mechanical engineering. Please take some time to read them all. From board draftsman, to 3D CAD designer, to 3D CAD/CAM program dealer, to 3D CAD teacher, some of this information may surprise you. This was the decade of the Pro/e clone. The Pro/E 3D CAD paradigm became the de facto standard. Its strict sketch, sketch, constrain, constrain history only design is cumbersome even for conceptual design. It becomes a horror show when you have to modify a part or an assembly. This design process demands that you have a good idea where you are going before you get there. This is called design intent. If you do not have the extensive required experience, you may even have to start the part over. I have to elaborate on the problems with modifying part and assemblies. This is by far the worst aspect of this paradigm. The level of experience and even intelligence is incredibly important. The design process is very precise, if done poorly it may be impossible to modify. Even the original designer, if away from the part or assembly for a while, may have a hard time understanding the structure. But if you have inherited a part from an inexperienced user it can be incredibly frustrating. This can be devastating it the part is tied to a drawing and is released into the system. With its separate part, assembly and drawing files it was by far the least productive 3D CAD paradigm for data management and document control. This convoluted paradigm led to the most obscure data management system: PLM. The structure of the separate part and assembly design has always been problematic. The major 3D CAD vendors have made “Top down” or “In context” available, but it is not a smooth process. Many users do not even use this incredibly productive process. Even then you still have external referenced parts. I have seen where you can have the complete model in one file. But this seems to be a poorly designed function and has its own problems and is not widely used. The drawing or what I like to call the AID (Associated Information Document) being a separate file adds to the complexity of PDM and PLM. The Pro/E paradigm offers no compatibility between the different Pro/E clones. Each system is in its own world. Each demanding a high level of training to be proficient. There are 5 popular programs. This has locked the companies to only look to engineering personnel with experience on the company’s 3D CAD system. This problem alone has made me wonder if 3D CAD is more cost effective than the prior system based on the drawing only. There is no standard process today in the engineering/manufacturing process. If you think about it all we added was the 3D model. This paradigm, driven by the vested interests of the huge CAD vendors, has cost the industry billions of dollars in the lack of compatibility, a common user experience, overly complex document control and complex operations. Sadly the inability to handle all of the different formats part, assembly and drawing spawned an incredibly unworkable system call MBE (Model Based Enterprise) this was an attempt to use the native 3D CAD file as the authorized engineering deliverable. They did this by creating a PMI (Product Manufacturing Information) what could only be called a 3D drawing. Each PMI is unique since it is dependent on the revision of the native CAD system. This decision alone, is causing chaos in the industry sending the engineering costs soaring. There were other more productive 3D CAD paradigms that were overlooked. Direct Edit, the original design paradigm was reintroduced in this decade to open the doors to a more compatible 3D CAD world. But today most are still stuck struggling with Solidworks, Catia, Creo, NX, Solid Edge and Inventor. But this paradigm is quickly reaching the end of its product cycle. The major vendors are running out of enhancements and the basic structure of the paradigm allows only non-integrated add-on modules that can only be considered Band-Aids. Autodesk and PTC are running out of new enhancements and are the first to try and lock you into their product by only offering subscriptions. 28 Years of 3D CAD Incompatibility - The New Generation of 3D CAD!! You are Not Stuck with Autodesk or PTC Subscriptions! well in place we could now work anywhere. I was selling CADKEY and IronCAD as the new century began. Solidworks was dominating the market. With no copy protection it was being passed around like hotcakes. It was the system to have. My customers were moving to it even though it was much less productive because you looked stupid if you weren’t using it. The Two CAD Programs that Set the Path to 3D MCAD Chaos! But CADKEY was incredible, it had just delivered the most flexible “Hybrid” 3D CAD system available. It had wire frame, good intermediate surfacing, Boolean solid modeling and had just added parametric history based modeling. The future was very bright indeed!! But Bob Bean from Baystate Technolgies, owner of CADKEY, decided that they needed to rewrite CADKEY. But instead of creating a new product to compete with the likes of Solidworks, Solid Edge and IronCAD, the 3 mid-ranged products at the time, he basically tried to duplicate CADKEY. It was a few weeks after 911. We were on one of the first flights after they lifted the flight ban. I flew out to Boston to meet with the PTC folks. I could now consider selling Pro/e since it had moved to the PC. I will get into that later. CADKEY was having a dealer meeting in Las Vegas. We were shown the new product line. They were first going to release a wireframe only package called “Graphx”. I started laughing. No one is going to buy a wireframe program. They said "Wait Joe. We are going to release other packages. Creator which would equal regular CADKEY and would add parametrics later." I said this will never work. CADKEY prior to Baystate had a collaborative relationship with the dealers. But they did not consult the dealers and this plan was presented in stone and was doomed to fail. Sadly, they did not listen to the dealers. As they released Graphx, the CADKEY customers were clamoring for fixes and enhancements that they expected in CADKEY 19. They could not move to or even use Graphx, it would be a huge step backward. So many made decisions to move to different packages. I sold a few IronCAD and many of the CADKEY dealers took on Solidworks and started moving their CADKEY user base to Solidworks. While in the midst of this change CADKEY lost a suit brought by another software company for a copywrite infringement. This cost over a million dollars and drove CADKEY into bankruptcy. Kubotek, a Japanese company came to the rescue. The product was finally released as KeyCreator. CADKEY was still the best program to talk to Catia, so many of the Boeing suppliers stayed faithful. The CADKEY dealer in Portland went bankrupt at this time and I took over their user base. KeyCreator V3 finally became as good as CADKEY and all were happy. But they did not provide the very necessary history/parametric design capabilities that would have made them a player in the future of 3D CAD. There was one very sad caveat, Robert White, creator of Fastsurf and Fastsolid, was left out in the cold due to this bankruptcy. Kubotek reneged on all of the contracts, it was truly a travesty of justice. Robert tried to sue but failed. I am not sure where KeyCreator would have gone with the added creativity of Robert White. Robert was truly a genius. KeyCreator continued on, not as popular, but still a productive Hybrid CAD solution for years. I will get into this more later. CNC 3 axis machining was becoming very popular. I was working with the MasterCam dealer and we were doing very good. But the fellow decided to sell CADKEY too. So we took on Surfcam. CADKEY with its intermediate surface capabilities was a great match for any of the surface based CNC systems. All of the Boeing suppliers had a seat of CADKEY and a SmartCAM, SurfCAM or MasterCAM. Even the NX guys that were using it for machining had a CADKEY for support. The high-end systems, even though now on the PC, never offered a viable support solution. The suppliers that supported large firm were the only ones that had a seat of the native software. Basically only to get the data out to their CNC systems. Now that Pro/E was on the PC they started looking for local dealers. I decided to sell Pro/E. I have to tell you this was not a great experience. I tried to learn the package. It was an incredibly convoluted way to design, sketch, sketch, constrain, constrain. The training was horrible. First Class: We were given a study manual. All was fine, but it mostly had us editing existing solids. Then you couldn’t even keep the training manual and examples. I was a dealer with over a decade in CAD sales and I just scratched my head. Second Class: I went to Vancouver, BC for this class. It had to do with skeleton something and modifying some parametric assemblies. I was lost and walked out of the class. It was absolutely useless. Remember I have been selling 3D CAD for over 15 years. I knew how to train 3D CAD. I have no idea how anyone learned this product. I struggled and finally did one project of converting drawings of aircraft parts to solid models. Just too complex to sell, support and use. I was only selling the basic package. The add-on modules took a staff to support. The dealer managers were horrible. It was all sales all the time. Being basically a draftsman I wanted to deliver the best product. This was not the best product. They came out with Pro/E Desktop to compete with Solidworks at a lower price. Sort of a Pro/E Lite. It was virtually worthless since it operated virtually identical to standard Pro/E. PTC will more than likely be the first of the high end systems to drastically downsize due to the lack of a mid-ranged program more cost effective solution that Dassault and Siemens offer. Solidworks were promoting their product to all of the CADKEY dealers. I just laughed and said who would buy this piece of crap. How was I to know that Dassault would buy Solidworks for over $300 million? Later I did have it available to bundle with my Surfcam sales. Still I found it just too limited to do our engineering. Here is a distressed project originally designed in Solidworks that I took over. I went back to my KeyCreator sales. I started out with 750 customers on current maintenance. The KeyCreator rollout fiasco soon dropped it to a couple hundred with sporadic sales. Sadly, IronCAD just kept stumbled along. This was a bit upsetting to me since it was the first 3D CAD tool I turned to for conceptual design. It was just flat out more productive and still is. Five Functions that Increase 3D CAD Productivity!! Autodesk Inventor was just released and was Autodesk’s first successful attempt at a professional 3D CAD system. But like all the others they did nothing more than give us another Pro/E clone. It is truly shocking as I stated in my preface that there was so little innovation in the area of 3D CAD by these huge CAD companies. This safe bet has put them in a corner that is going to be tough to get out of. But we will get into that in my next article. I was offered a dealership for Solid Edge. Everyone in engineering had a copy of Solidworks. Like Pro/E, Solidworks was just too limited and took too much time as compared to IronCAD and KeyCreator. I started learning Solid Edge, It was just another Pro/E clone like Solidworks and I just could not use it. I had a healthy design service going on and the Pro/E clones did not offer more productivity. I could not sell what I couldn’t use. While a Solid Edge Dealer, Siemens came out with ST (Synchronous Technology) it was standalone robust direct edit modeler. I had been doing Boolean or direct editing since the introduction of FastSolids. IronCAD is the only integrated history/direct edit system. It was great to see this capability finally get some attention by the large 3D CAD companies. SpaceClaim had also just came out and I was very interested. It was a direct edit only package like KeyCreator but for solids only. I decided to become a dealer. I had both SpaceClaim and Siemens ST on my computer. Both programs used the new Microsoft Office Ribbon interface. It was quite strange, at first I thought that Siemens actually bought the technology from SpaceClaim or visa versa. They were incredibly similar in operations. I guess there are only so many ways to create solids with direct edit (this fact makes it much superior to the history based systems). Slowly I started noticing the differences. Siemens ST was much easier to use. Since I would not use Solid Edge in my engineering I quickly lost interest and dropped the product since I could not support it effectively. I sold SpaceClaim for a while but it did no more than IronCAD and KeyCreator. It was a bit of a strange package and was not comfortable to use. It was a very good 3D CAD package, but mostly focused only on editing existing solid models. I feel that you need both history and direct editing available for productive conceptual 3D design. I finally dropped it. The company was virtually lacking in marketing experience and had no idea how to handle the dealers. It was like they were working against us. Here is a little project I did with SpaceClaim. I directly attribute the budding popularity of Direct Editing to SpaceClaim and Siemen's ST. After their release all of the other packages started to offer Direct Edit functionality. 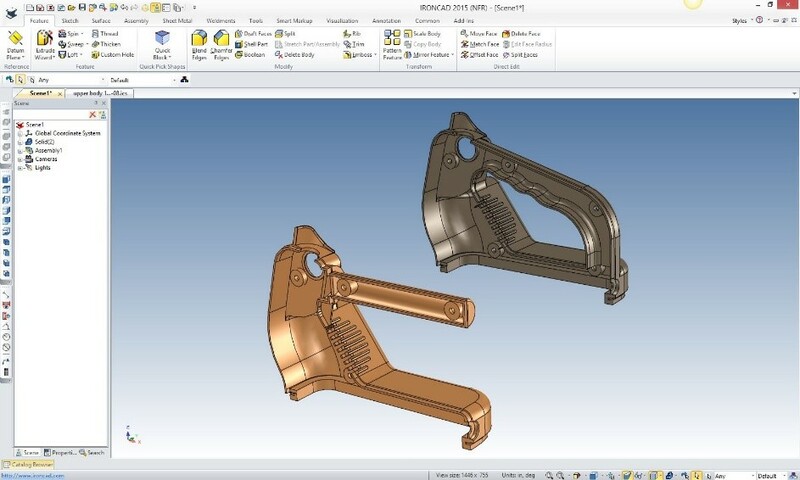 Solidwork, Inventor Fusion and PTC incorporating CoCreate. Sadly, it has still not become part of the design process. I have finally come to the conclusion that the Pro/e History base paradigm cannot be modified to functionally integrate direct edit and basically stuck history only modeling. Universal 3D CAD Compatibility is "Not" Here!! There is only one program that has resisted incorporating direct edit and that is Catia 5. If there is anyplace where the only constant is change, it is commercial airplane design. I have worked with Boeing and Catia for over 30 years. Dassault is responsible for keeping Boeing one of the most ignorant and isolated manufacturing companies. Their lack of interoperability is beyond belief. As I described in my preface every popular package in this decade was a Pro/E Clone. They all had separate part, assembly and drawing files. The purpose of PLM was to take all of engineering documentation and streamline it in to one well-oiled machine. Sadly, it was led by IT experts, MSMEs and PHDs. They had no clue how the engineering/manufacturing process worked. I am shocked at their lack of applicable knowledge. They took a top down look and never understood the basics. It is like they never reviewed or understood the proven standard engineering document control standard when based only on the drawing. Engineering is a bottom up process. IT only understood “Data”. But engineering did not run on data but documentation. Trying to make this documentation into data would never be. PLM was becoming a major component of the high end 3D CAD packages. They could not maintain all of these different files. They came out with MBD (Model Based Definition). But we had already been doing this for years. They quickly realized they could not manage the part, assemblies and drawings that were part of the Pro/E clone world. They needed one file to maintain. They decided to develop MBE (Model Based Enterprise) use the native CAD file in the form of the PMI (Product Manufacturing Information). This was a mistake made by those with virtually no applicable knowledge. Since the late 1990’s the standard engineering deliverable was the 3D model in a native or neutral format and an AID (Associated Information Document) in the form of a PDF. They were put into an email sent to the suppliers. The native file is not a good conduit to dispense engineering information to manufacturing even if it is in the same CAD system. I have fellows at Boeing using Catia CNC and they are having the same problems as the outside suppliers. It is a bit funny that Boeing has 160 seats of Mastercam. I wonder if the inside groups are required to create a validation sheet? Just FYI they are still sending engineering information by email. Compare and Validation Programs? Band-Aids for Self Inflicted Wounds! The 3D CAD PLM system is now in charge of the engineering process, requiring the engineer to now be a data management expert. The Document Control Group was a subset but separate part of engineering. Engineers engineered in those days. This is an incredible waste of time for the engineer and is really outside his profession. But then so is drafting, for that matter. There is no engineering management today. It seems like they have handed over all responsibility to the PLM system. The PLM system has no understanding of the engineering process and we now have no engineering standards. Anything goes. Engineering has two separate functions: Design and Drafting! Drafting is more important than design. It was responsible for delivering concise, complete and unambiguous documentation to manufacturing which is required to manufacture our parts and assemblies. Today there is no one overlooking this process. But this was the first decade. The die has been cast. It is being driven by an incredible level of ignorance and vested interest. It is truly a failed system. But there are only very few that see this. They never asked the Drafting Group that did all of the documentation for their opinion, none have BS, MS or PHD's. Drafting was a precise standard process that could be taught in 2 years. Myself, I took a 480 hour 12 week course to be come a certified "Aircraft" draftsman. Engineering Documentation Today! This is by far the most shocking Article. 2009 was a devastating time for TECH-NET. KeyCreator sales were down to a trickle. We still had a couple of hundred current maintenance contracts that were our bread and butter. The folks at Kubotek were struggling and saw this maintenance money and decided they wanted it. They went direct. This put me in a bind for a hybrid modeling package. Today you rarely see KeyCreator used. Direct edit only packages offer only half the design capabilities. You truly need both functions integrated and available for design. IronCAD is the very best with ZW3D is a close second. I found ZW3D which is the most complete Hybrid 3D CAD/CAM system to replace KeyCreator. I first got it for my associate that was supporting the CNC package in KeyCreator. He said he just could not use KeyCreator CNC and I we took on ZW3D with its integrated CNC. I found it a bit weak in the CAD area. While it could do the job it was like Solidworks and Solid Edge to use. But the ZW3D folks have been working on the user interface and it is a much more user friendly product with usable integrated direct edit with added primitive shapes. With much more capabilities than KeyCreator. Both KeyCreator and ZW3D had a single model environment and integrated drawings which allows you to do complete projects in one file. How easy would that be? Basically the only real enhancement to the popular programs in this decade was the introduction of direct edit. I was hoping that this would open the door to complete compatibility but direct edit is just a clumsy add-on to the Pro/E clones and cannot be effectively used in the design process. So we come to the end of the new centuries first decade. We were now stuck with a dated 30 year old plus modeling paradigm. How can a industry not offer any new innovation for that long? Even Onshape, released in 2015 offered no 3D CAD modeling innovations. 3D CAD delivered in this format has not added much productivity. The popular 3D CAD systems keep stringing the users on by adding a few enhancements here and there. Most are starting to realize that it is not worth keeping their maintenance current. Autodesk moving to subscription only is the writing on the wall after losing half a billion dollars. PTC also is having a hard time making any enhancements worth the annual maintenance, being forced to move to subscription only to keep the cash flowing. The Pro/E paradigm cannot be made into the new Hybrid Modeling that offers unlimited flexibility in design. Today many use separate modules that do not smoothly work together. Many even use separate packages like Alias to do surface design with a separate solid modeler. PTC has both Creo Parametric and Creo Direct, doubling the work and causing compatibility problems. ZW3D is rising to the top of the Hybrid Modelers. But I am getting ahead of myself. The next decade offers little for the existing popular 3D CAD programs. 2010+ – The age of 3D CAD for rent!! Here is a taste of what is there. This is my favorite and most popular article.